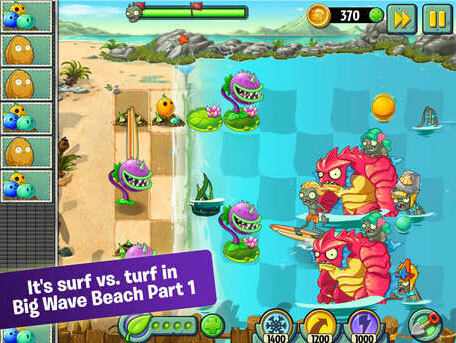 It’s time to hit the beach in Plants vs. Zombies 2. 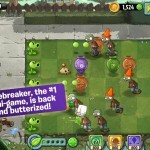 The popular sequel has just been updated with new plants, zombies, and more. The top new feature in the aptly named Big Wave Beach, part 1 update is 16 new beach-themed levels. Along with four new plants, including the return of the chomper, players will get to battle six new zombies. My favorite looks to be the Bikini Zombie. Here’s a behind-the-scenes look at some of the new content. Click here if you can’t see the video. As a nice touch, dynamic high and low tides will change throughout each level to add even more difficulty. And just in time for Halloween, players can take advantage of spooky themed costumes in the Lawn of Doom Piñata Parties, starting on Friday, Oct. 24. Gamers will be able to dress their plants up or down. Finally, the update brings an all-new Bowling Bulb mini-game. A universal app designed for the iPhone/iPod touch and iPad/iPad mini, Plants vs. Zombies 2 can be downloaded now on the App Store for free. 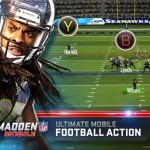 A number of in-app purchases are available. But unlike other titles, spending money isn’t vital to progressing through the game. For other recent app news and reviews, see: Skype Qik is the latest app to offer Snapchat-like video messaging, Every hand counts in Poker PLAY!, a challenging puzzle game, and Take note: UpWord notepad app goes universal for iPad.